Surely you’ve heard about how good pastured, grass fed meats are for us. The saturated fats are rich in Omega 3 fatty acids and help keep our bodies’ levels of Omegas in balance. Our cell membranes are made up of a double layer of fatty acids. Saturated fats constitute at least 50% of the cell membrane. Because saturated fats tend to be more solid, they help give the cell membrane a stiffness necessary for proper function. Healthy skin cells with sufficient fats would make for healthy, toned skin. Interestingly, tallow fat is around 50% saturated fat – just like our cell membranes, so its logical that tallow would benefit our cell biology. Tallow also contains the fat-soluble vitamins A, D, E and K which are found only in animal fat. Tallow from grass-fed animals also contains conjugated linoleic acid (CLA), which has anti-cancer and anti-inflammatory properties, as well as palmitoleic acid, which has natural antimicrobial properties. One of the things I’m constantly telling people is “everything that goes on the skin should be edible – because your skin absorbs everything!” People light up when we get to talking about this – such a basic truth rests well on their hearts. I’ve had so much fun working on the formulae for these. And to have customers asking for them was such a confirmation! I KNOW the beef and buffalo tallows in this are grass fed because I obtained the suets from reputable grass fed outfits and private hunters and rendered it myself. (See my post titled Grass Fed for more info). Bison Balm – In Your Face – Balm is enriched with cholesterol Esthers, lanosterol esthers, olive squalane, jojoba oil and organic lemongrass essential oils. 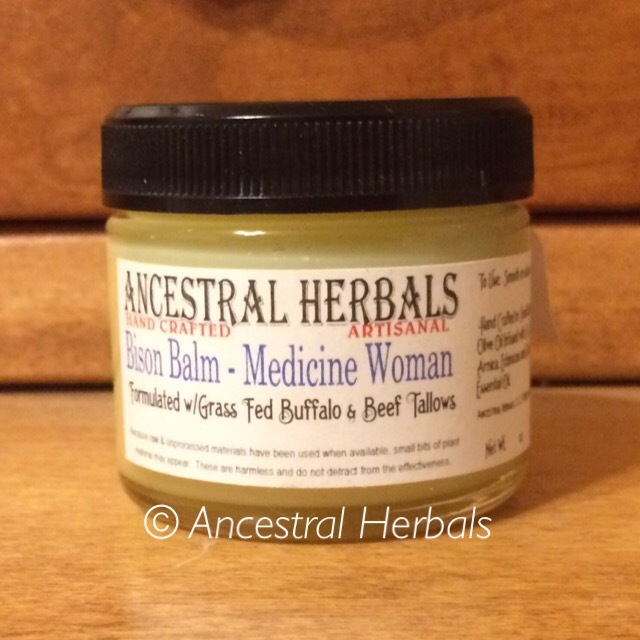 Bison Balm – Medicine Woman – Balm enriched with herbal oils that encourage healing. Bison Balm Bare – Plain, unscented balm.